Introducing ‘Organami’ the folding of paper to make organs! Inspired by origami, the Japanese art of folding paper to make decorative shapes and figures. My goal is to design easily reproducible 3D anatomy models for studying. No more expensive plastic models locked away in the school’s cabinets collecting dust. Instead, desks and kitchen tables at home will be cluttered with Organami! Backpacks of medical students around the world will be filled with squished and crumpled models, but no need to worry. 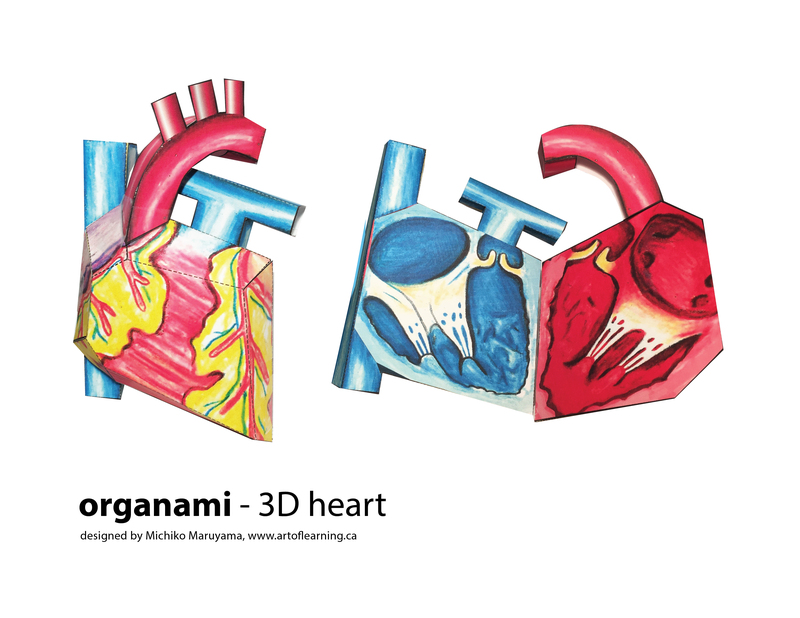 With a click of a button, students will be able to download and print another Organami activity sheet which they can cut out, fold and glue together for more 3D anatomy studying fun. I have turned my Organami idea into an upcoming self-directed gross anatomy elective project, so please check back soon for updates! I am currently working on the kidney, heart, lungs, liver, hands and many more! Ready to go downloadable files. Download, follow the instructions, cut, fold, glue, play and learn! 2D Heart, colour – A simple anatomical heart locket. heart anatomy 2D locket – Blank – design your own heart! Great for cards! 3D Kidney, blank – Print this off, colour and label it, then build your own kidney!